A/C crashed near Runway 6 while attempting landing in foggy conditions at MacArthur-Long Island Airport. Pilot was performing a second ILS approach when A/C traveled 3/10 nm past the runway approach end, turned approx 180 deg. and traveled 3/10 nm back towards the approach end of runway. At 2017 hours the A/C impacted the ground in a 30-deg. nose-down level attitude resulting in a 57 G's crash force. 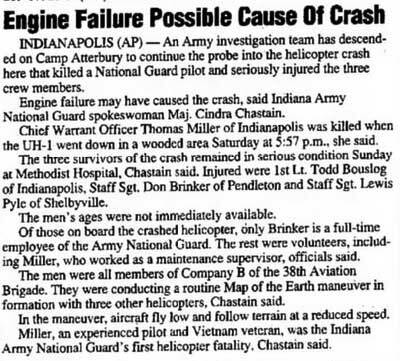 A/C was in flight of four when it crashed at 1757 hours approx 8 mi SE from Camp Atterbury during routine NOE training due to failure of the forward reduction gear assembly component of the A/C's engine. 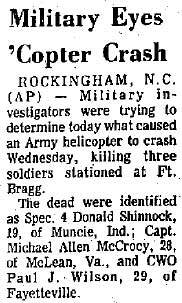 *Miller was the first helicopter fatality in the Indiana ARNG. A/C was on a low-level, NOE NVG navigation training flight approx 2 miles E of Samson at 2100 hours in Geneva County. Approx one minute after takeoff as A/C was making a left downwind departure from LZ after hot refuel, the A/C struck the ground in a left roll, nose-low attitude traveling 60-70 KIAS. Investigation suspected that they continued flight using degraded visual cues that caused them to falsely interpret their altitude and visible horizon. 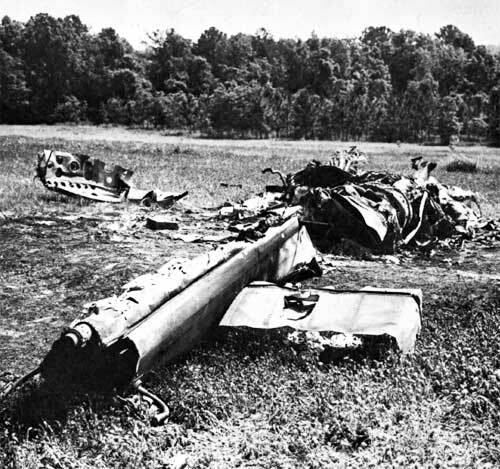 As a result, the crew became spatially disoriented and flew the aircraft into the ground. Mid-air collision at 1519 hours between two UH-1H's at Camp Ripley Military Reserve near Little Falls during an Army National Guard exercise. A/C crashed in a field near Allen Stagefield near Wicksburg at approx 1510 hours while on a routine student pilot training mission. A/C impacted ground nose low and in left-bank attitude. Pilot lost control after a small metal stud broke and key parts fell off the M/R assembly. A/C crashed and burned 3 mi south of Turkey Creek Ranch while on a routine training mission from Ft Carson at approx 1050 hours. 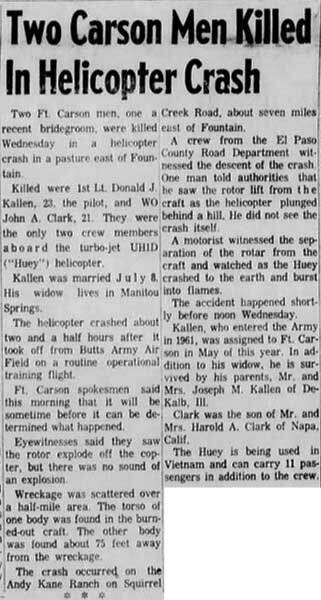 A/C was skimming along only 4-6' above the rugged prairie at an estimated speed of 100 mph, when the pilots banked into a sharp turn, causing M/R blades to strike the ground. A/C on a medical evacuation mission crashed into a mountain at approx 3000' level, outside of Soto Cano AFB near Comayagua. A/C was on a medevac mission under NVG's when AAA fire hit the T/R causing acft to enter an uncontrollable spin. At some point during spin, CE was thrown clear of acft and impact with ground caused xmsn to fall over which crushed the medic and the pilots were pinned against the instrument panel. Post crash fire engulfed the A/C. A/C was climbing to cruise altitude shortly after takeoff in flight of two when it encountered T/R stoppage. A/C rolled right and entered right, nose-low, spiraling descent. 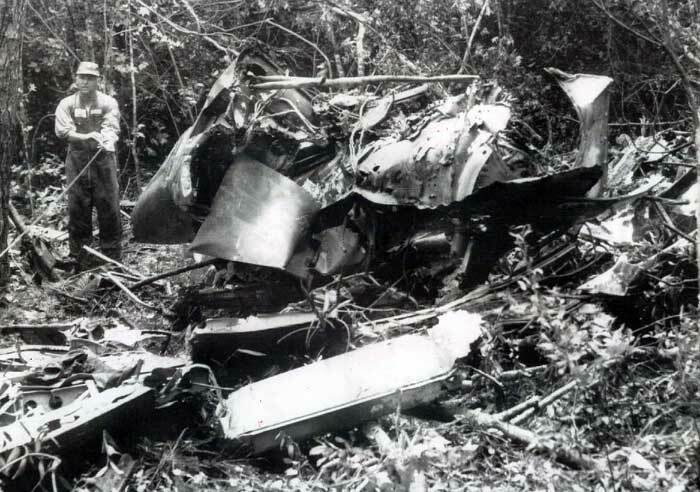 At 1550' AGL, A/C appeared to resume level flight attitude, lost fwd airspeed and entered flat right spin, stopped spinning at 500' AGL and fell vertically into Lake Ilopango and immediately sank to depth of 200'. During a night-aided flight at 75' AGL and 60 KIAS, pilot made an evasive right turn to avoid another acft and while still in a slight descent, hit 10' berm. 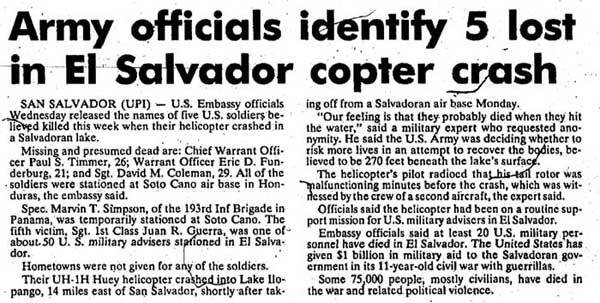 Shot down by an FMLN patrol in San Francisco canton at approx 1430 hours in Lolotique district, Department of San Miguel, while flying at low altitude. 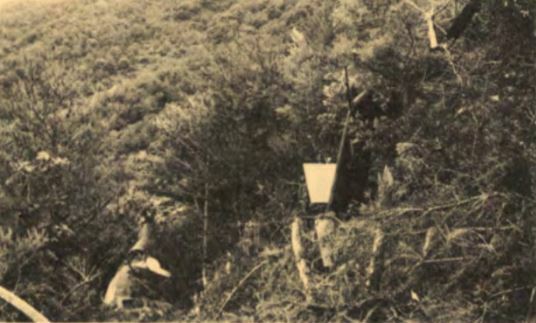 Crew successfully autorotated down the side of a hill after crossing a ridgeline. A/C crashed into a 4 foot boulder, and then rotated 185 degrees around it. 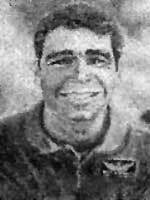 CW4 Daniel Scott was killed instantly as his side of the A/C struck the boulder. Dawson and Pickett were executed by FMLN. 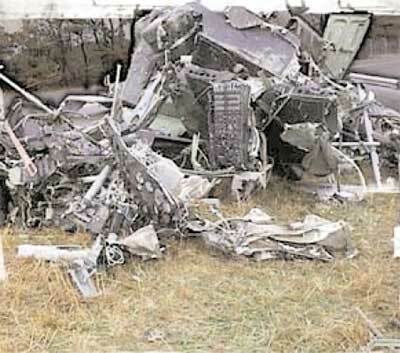 A/C crashed in a densely wooded area south of Cleveland, near the Tarkington VFD at FM 321 and Texas 163 while flying to Beaumont port for deployment to Desert Storm. 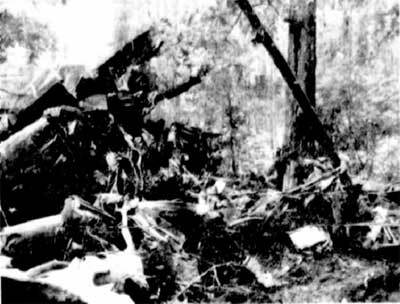 The A/C flew on its side into a thick stand of trees after the pilot apparently became disoriented and lost control after the A/C turned while some helicopters flying with it maneuvered to avoid thin, low clouds. A/C crashed into Lake Ellsworth (15 mi N of Ft Sill) and sank in 15' of water while conducting over water training under NVGs. A/C crashed near the islet of Evreos in the Saronic Gulf of the Aegean Sea SE of Corinth on a routine flight from the Southern European Task Force Base in Vicenza, Italy. 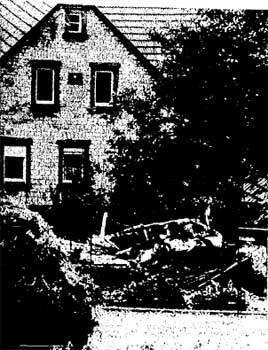 At 1825 hrs, witness on the northern coast reported low-flying acft flying over her house, followed by silence. A/C descended while in left-banked attitude and impacted water at high speed, sinking to depth of 220m. 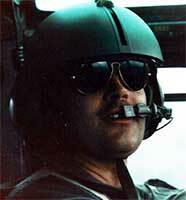 A/C was part of a 4-ship lift combat engaged/peacekeeping mission over jungles on the Atlantic coast of Panama. 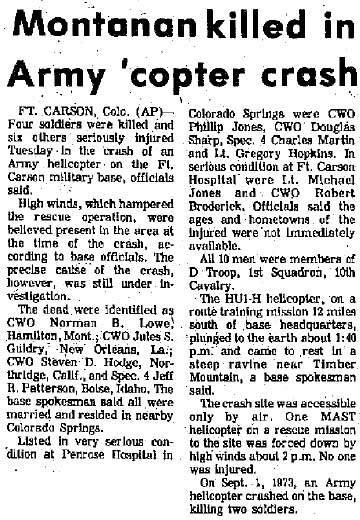 A/C crashed into a mountain while searching for the OH-58 Involved that crashed into the same mountain. 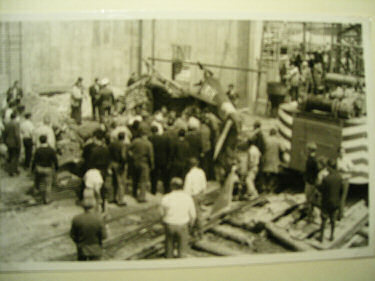 Wreckage found 2 days later. 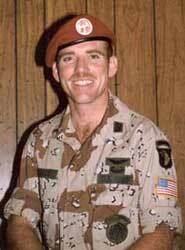 *Meints was in my unit in 88-89. A/C crashed 25 miles SE of Boise near Danskin Peak while flying NOE. 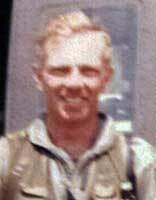 A/C crashed in dense fog around 0003 hours EDT near Yarmouth on a combined passenger delivery and training missing from Providence to Camp Edwards. A/C was on a night unaided Joint drug interdiction mission (Operation Border Ranger) when it was going to intercept a suspect vehicle. A/C went into a descending right turn and struck two guy wires of a power line at 2130 hours and exploded into a hillside at the foothills of the Laguna Mountains. A/C was in flight of 7 acft on RTB from a 5-day field exercise to Goeppingen, proceeding in loose trail formation. Visibility was poor with ceilings estimated at 400-600'. Flight flew over serveral sets of power lines then descend to lower altitude after crossing. Flight slowed to about 50 KIAS and crossed a tower at less than required 50' clearance when Chalk #4 descended onto the tower while returning to cruising altitude. A/C crashed in a field along a heavily traveled highway near Hittistetten. A/C crashed and burned in a heavily wooded area about 1 1/2 mi S of Troy airport near the Oak Grove Methodist Cemetery at approx 2000 hrs. 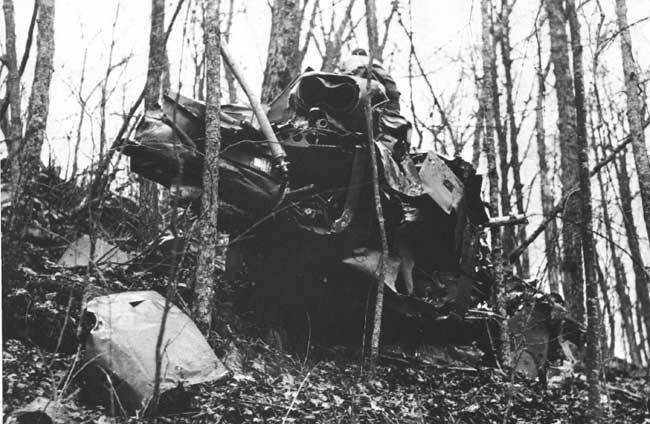 A/C was peforming an NVG Medevac mission of a wounded military advisor when they entered IMC, initiated proper emergency procedures, re-entered VMC, was in level attitude at cruise airspeed when it struck the side of a hill 38' below the ridgeline at approx 2256 hrs. Among those killed were the deputy commander of the US Military Group and 5 Army helicopter crew members and medical specialists. 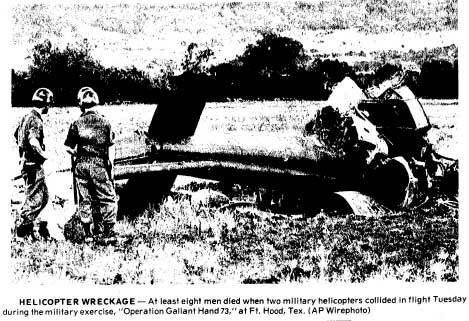 A/C entered a nose-high climb, with a 180-degree turn at the top, followed by a nose-low descent return-to-target manuever when the T/R hit a tree and crashed and burned on West Ft Hood at approx 0945 hours during Starburst '87 exercises. NOTE: This A/C & crew took off from our flight line, where it was based when not in field. 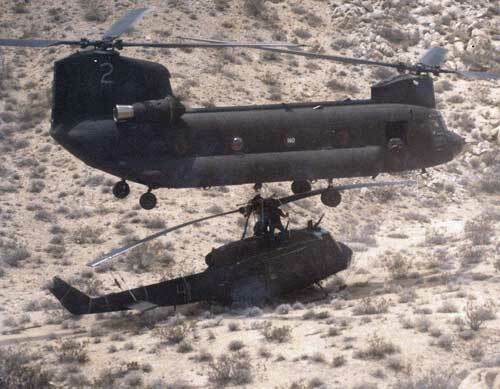 A/C crashed approx 2 miles W of the main gate at Ft Irwin at 1815 hours while enroute to a field support site. A/C was repositioning from field FARP to cantonment area, at approx 20-30' AGL and 30 KIAS, when A/C went into a rapid descent, crashed and burned. A soldier of a field arty observation party exited properly to front of A/C but while attempting to return to acft to pick up additional equipment, walked into the T/R during a training exercise at Ft Irwin. A/C crashed in a remote swampy area about 2100 hrs approx 3 mi NW of Ft Stewart while enroute on a MAST mission to rescue two victims of a car wreck under special VFR clearance. Wx was 200' scattered, measured 500' and overcast. Visibility was 3 mi with light rain and fog. Approx 2 min after takeoff, 4nm NW of airfield, A/C struck an 80' tree, 59' above the ground and traveled another 345' as it descended through a heavily wooded area, striking several more trees before ground impact. Wreckage discovered at 0850 hrs the following morning. A/C crashed into the east side of San Bernardino National Forest approx 15 SE of Big Bear Lake (Hell For Sure Canyon) at about 6000' level. Crew thought they spotted a downed aircraft and descended to approx 20-30' above trees, slowed acft below ETL, spun right and into trees, hitting the ground nose down. 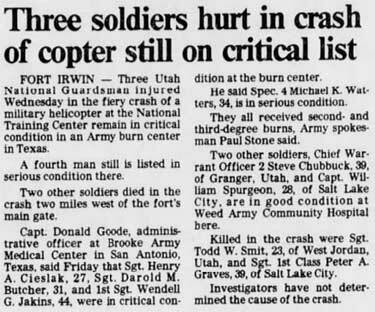 Crash took place during Gallant Eagle exercises and acft was based in Ft Sill. Two Hueys participating in a mock disaster drill took off from airfield in loose trail formation for about 3 mi before turning back toward the airfield. 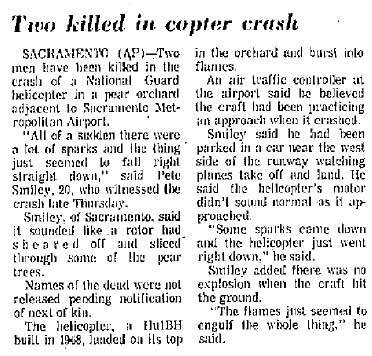 They then formed up in a side-by-side formation to fly past a picnic area at approx 25' AGL and 90-100 KIAS when M/R blades made contact and crashed. Chalk 1 continued straight and level, hitting the ground in an almost level attitude, slid 326' before coming to rest upright. Chalk 2 hit the ground in a right nose-low attitude and tumbled approx 292' before coming to rest in an inverted position. 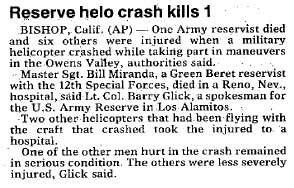 Pilot and medic in Chalk 2 acft were killed. A/C crashed near Ras Nasrani during a prephase maintenance test flight in Sinai. Suspect cause of the crash was due to red blade PC link fatigue failure. A/C lost power, made a low-altitude, 180-deg turn back to landing area, bled off rotor RPM and crashed nose low into a field in East Finley Township during flight test at approx 1250 hours. Cause was determined to be explosive engine failure as the result of corrosion of the #1 bearing. A/C shed the xmsn cowling, then removed the M/R control tubes. 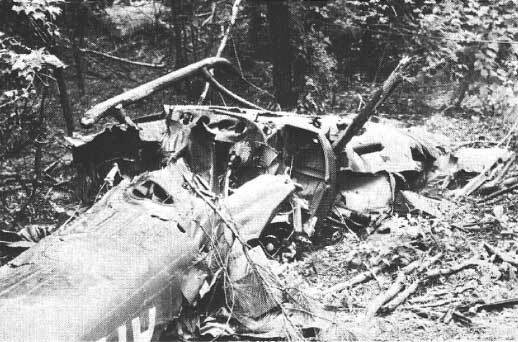 After about 20 minutes of flight, CP announced a decrease in rotor RPM and A/C flew into trees and crashed. 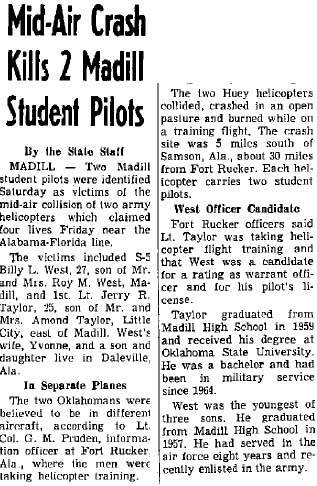 A/C was Chalk 2 in flight of three in loose trail formation, when it broke formation and descended to an altitude of 50-75' for about 2 mi. A/C then passed over a lake, made a steep cyclic climb and a 180-deg turn with approx 60-deg angle of bank, followed by a steep dive. After pulling out of dive, A/C repeated the manuever but could not stop the excessive rate of descent in the dive and crashed in a near level attitude about 8 miles SE of Bishop while taking part in manuevers in the Owens Valley at 0930 hrs. Victim (USAR) was assigned to 12 SF unit. A/C was performing a hydraulics off go around at a Skelly Stage Field. 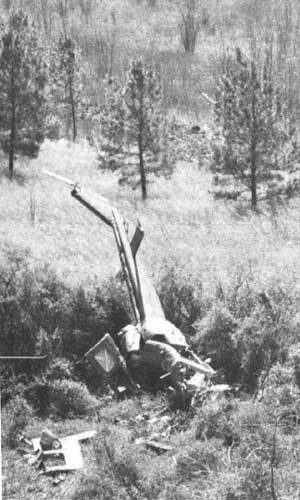 As A/C reached 400-500' AGL, mast bumping occurred causing loss of the rotor head, rolled inverted and crashed into trees at approx. 1700 hours. A/C crashed at 1510 hrs in a heavily wooded area in lower Richland County while on an MTF after replacement of M/R system swashplate and engine fuel control. 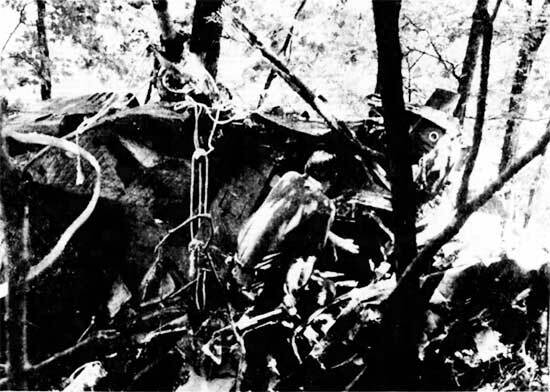 In-flight breakup occurred causing M/R system and T/B separation before high-speed impact into trees. A/C crashed at approx 1815 hrs in woods 3 mi north of Ozark during a training flight. IP initiated simulated forced landing and noticed rapidly decaying engine and rotor RPM. IP told student he was assuming controls, but student would not release controls. A/C hit trees and crashed in swampy area. A/C crashed and burned at 0500 hrs in a hilly region near the coast of Northern California about 60 mi S of Ft Ord while on a routine flight of four. 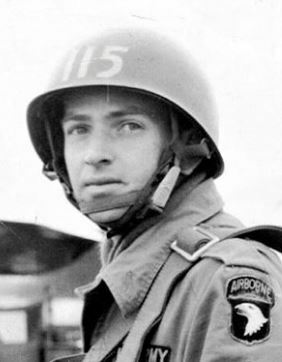 Air mission cmdr placed the Inf airmobile operation on a wx hold due to ceiling 100' and visibility 1/2 mi, but ordered the flight to be repositioned. 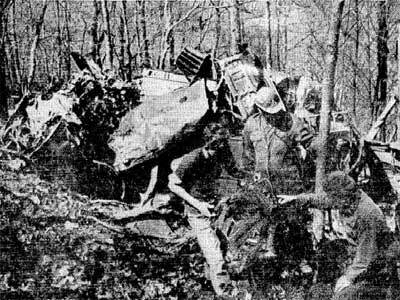 As A/C began a straight-up hover to about 80', it entered fog and clouds, paused, turned left and then began a descent, pickup up airspeed, traveling approx 1000m, crashed on a rising slope, rebounded into the air hitting two trees and came to rest on level terrain. A/C crashed into a tree and exploded in flames about 1600 hrs in 11 Mile Canyon, approx 10 mi W of Florissant, during a medevac of an injured mountain climber that fell off a cliff. While flying through the canyon, A/C completed a steep right turn and then rolled into a steep left turn. Combination of high airspeed and steep banks resulted in loss of altitude causing M/R blade to hit top of tree. Medevac acft crashed and burned at Salt Lake City International Airport at approx 2146 hours on the Army's portion of the airport's west ramp. A/C was cleared to land on sod next to runway, when it touched down hard and crew attempted to recover, became airborne again, flipped inverted, rolled and came to rest upright. A/C departed maintenance ramp at Fliegerhorst Casern to the north and after clearing the boundary fence and about 200' AGL, the M/R assembly separated and fuselage crashed to the ground. Cause was due to corrosion in a single bolt in the M/R subassembly. A/C departed Hood AAF at 1330 hrs and arrived at field site near Gorman Falls at approx 1400 hrs where they dropped off supplies and picked up 3 PAX. A/C departed the site at approx 1415 hrs and proceeded downstream to recon the river. At 1426 hrs while flying at approx 75' AGL and 90 KIAS and approx 7000m from field site, A/C struck a 2-wire, triple-strand power line crossing the river to Lemons Springs Camp. 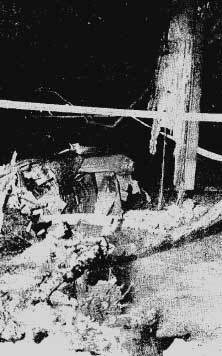 One wire wrapped several times around the mast, swashplate and flight controls before breaking, resulting in total control loss, striking branches of large cottonwood tree on the NW bank of river. A/C rolled and tumbled a distance of 130' until coming to rest on its right side on a heading of 225 deg, approx 530' downstream from the wires. 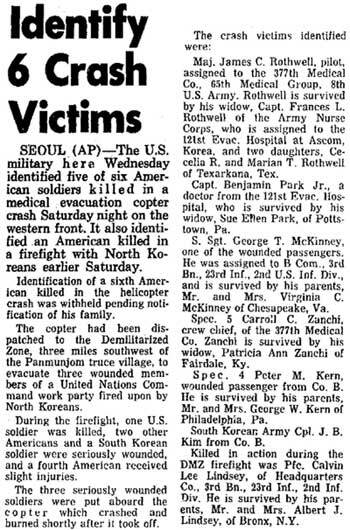 *PVT Chatwin died 7 days later of injuries. A/C from Ft Carson was on a SAR shortly before noon while ferrying searchers to look for the remains of a man stranded by a Christmas Eve plane crash, when engine and rotor rpm bled off during approach to LZ. 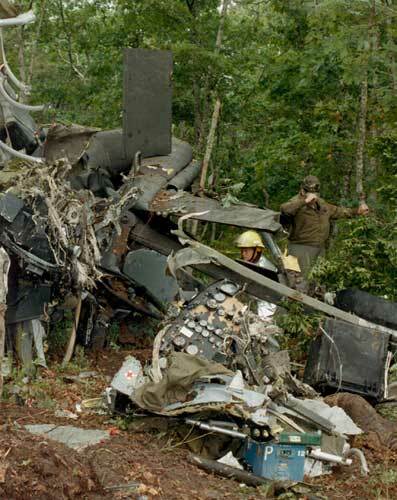 Crew was initiating a missed approach but airspeed was slow and A/C descended in a slight turn, hitting trees and coming to rest on right side. A/C crashed while performing hydraulics-off emergency procedure at Skelly Stagefield. 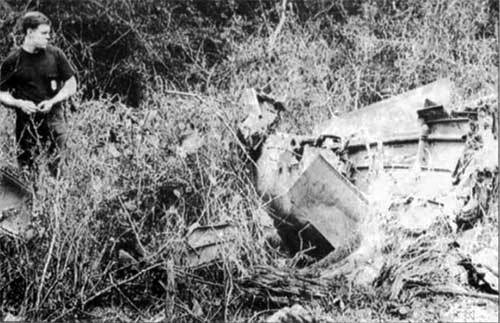 At an altitude of 15-20' AGL and very slow airspeed, the A/C pitched nose up and climbed to 50-60', rolled inverted and crashed. Investigation revealed that IP allowed student pilot to put the A/C in an attitude from which it was impossible to recover. A/C crashed in Lake Tahoe at approx 1618 hrs during a flight with an unauthorized civilian PAX onboard. Crew was performing a routine cross-country training flight from Ft Lewis to Stockton, when the A/C landed at South Lake Tahoe Airport. A/C departed the airport for a half-hour flight with the PAX and minus one crewmember. A/C was on a routine training mission out of Ft Rucker when it crashed and burned near the Crenshaw-Covington county lines just off of CR 43 and a 1/4 mile from Hwy 331 about 7 mi S of Brantley. 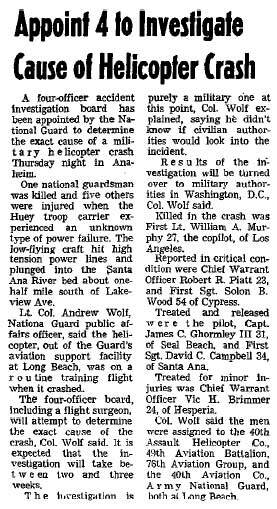 They were flying an NOE maneuver when the crash occurred. Investigation concluded the cause of the crash was due to engine failure. 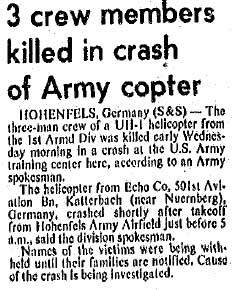 A/C crashed shortly after takeoff at 0500 hours from Hohenfels AAF near Nuremberg, during a routine flight over the Hohenfels Training Area. Primary causes of crash were determined to be crew fatigue, lack of experience and a 10 deg. precessing main attitude indicator. 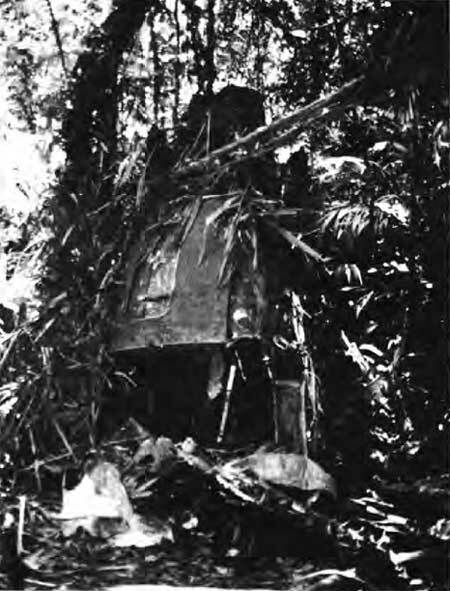 A/C crashed while flying an observation mission on an Organization of American States peacekeeping mission during border disputes between Ecuador and Peru. ELT was not installed on A/C and aircraft could not be located after a month long search. 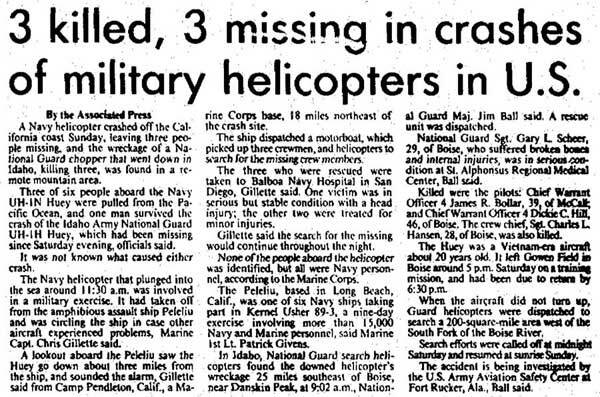 Search was officially suspended on 10MAR81. A/C crashed during Operation Brimfrost at Ft Wainwright. A/C had just refueled and was taking off from a tactical site at Clear Creek when it lost a T/R blade which struck and fractured a M/R blade. The xsmn departed the A/C from the vibration. 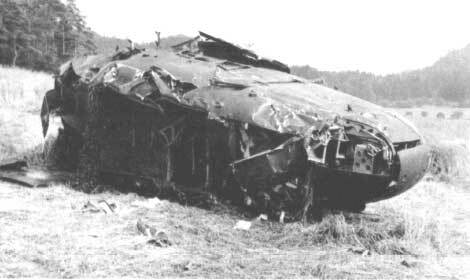 The CE that survived was thrown from the descending A/C at about 200' and lived. A/C was on a tactical service mission with crew of 3 and 5 PAX on Ft Bragg. A/C was performing NOE at 60 KIAS and 35-50' AGL. During a left turn, pilot initiated deceleration by raising nose. T/B hit the tops of some trees, knocking off the T/R and 90 deg gearbox, collective was increased and A/C began spin to the right. 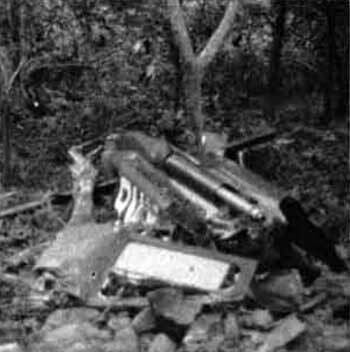 Two or three revolutions then occurred and pilot reduced throttle to stop the spin and A/C descended vertically and hit the ground in a 30 deg nose-down attitude. Three PAX were ejected with two receiving major injuries and one slight injury. 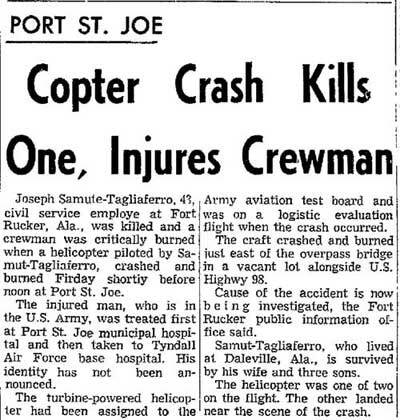 CP was killed when stabilizer bar hit him in the back and pinned him against the instrument panel. A/C was #2 in flight of 5 that took off on training flight from Ft Lewis in wx conditions below that required for night VFR. Approx 5 min after takeoff Chalk 2, flying at 100' AGL, lost sight of lead and inadvertently entered a descending left turn after becoming spatially disoriented and crashed in the Anderson Butte area of the Siskiyou Mountains in Southern Oregon. 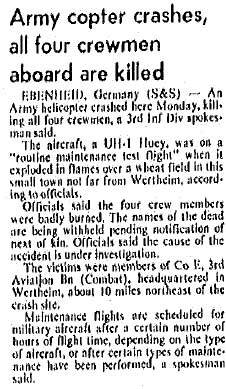 A/C exploded and crashed in a wheat field near Ebenheid during a routine maintenance test flight. A/C and crew were based at Peden Barracks in Wertheim. Spring pin in fuel control failed because of stress corrosion, resulting in power loss. Xsmn displaced in flight, allowing M/R blade to sever tailboom. Exact cause of stress corrosion could not be determined. A/C was on a MAST blood run and had dropped off the blood at Madisonville, KY hospital and was returning to Ft Campbell flying at 75' AGL when it hit a powerline severing the M/R push-pull tubes. A/C became uncontrollable, crashed coming to rest inverted in the grassy area between the east and westbound lanes of the Pennyrile Parkway at 2000 hrs. A/C took off from local airport and flew along the shoreline of Medical Lake for several miles about 300 yds offshore cruising about 90-100 KIAS and 20-30' AGL, initiated a slight right turn, entered a shallow descent allowing tail to hit water first, rotated forward and entered the water in a right, nose-low attitude. A/C crashed approx 5 mi W post near Monroe Mountain due to separation of drive link trunion bearing from swashplate. Separation of white drive link caused an uncontrollable descending right turn and crash into trees. Investigation determined that the torque on the clamping bolts of the swashplate outer ring trunnion bore was less than prescribed resulting in the trunnion bore wearing through the retaining bolts and coming out in flight. 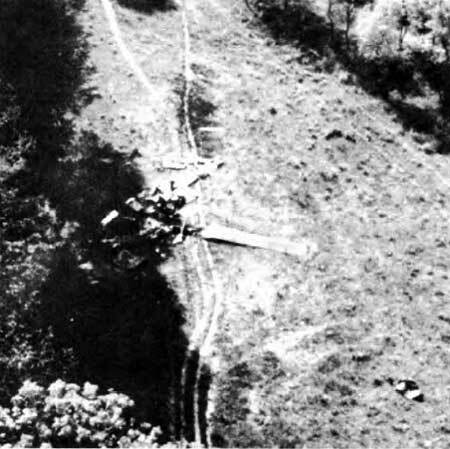 A/C was on a low-level navigation training mission using contour flying techniques when it hit two wires about 80-85' AGL and crashed in an open field near the Main River north of Wuerzburg, 1.2 miles south of Karlstadt. Suspected that pilot's attention was diverted shortly before wire strike to master caution and right fuel boost pump light that illuminated. A/C was on final approach during hydraulics-off landing and did not maintain proper lane alignment which was aggravated by the application of left lateral cyclic at reduced airspeed. 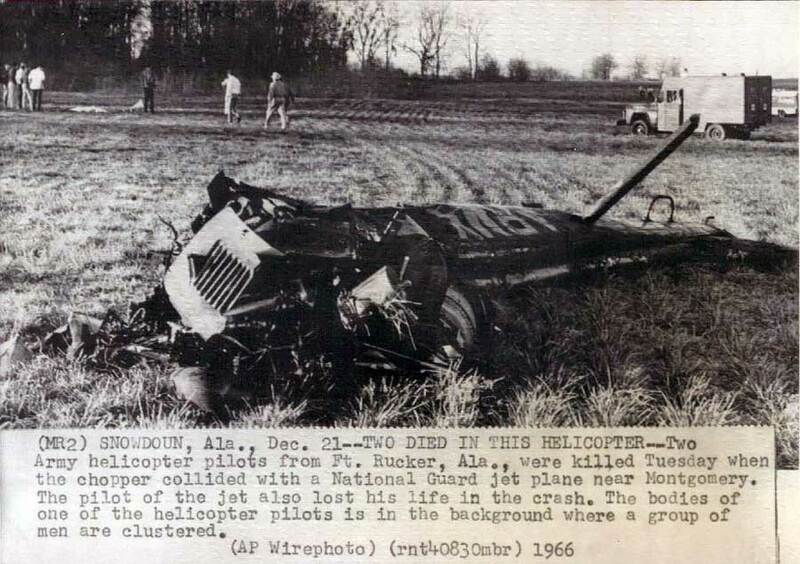 A/C became uncontrollable, hit the ground and slid about 60', coming to rest on its right side. Shortly after takeoff at approx 0025 hrs, A/C suffered engine failure at 300-500' AGL. PIC was flying from CP seat was unable to turn on landing light during autorotation and pulled collective too high causing A/C to fall through, hit the ground and burn, approx 4 miles NE of Chaparral on the McGregor Range while on a training mission from Ft Bliss. A/C tookoff from Ft Knox on a flight to "burn off" some time so it could be carried in for a scheduled inspection. After 48 minutes into the flight, A/C flew over Nowlin Lake at approx 20' AGL passing close to a boat, climbed, then descended and proceeded on a northerly course flying about 50' above the water where it hit powerlines. 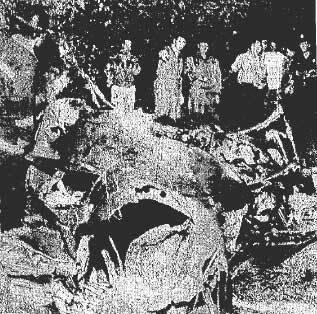 The nose and windshield area was destroyed and A/C traveled forward 25 yds, rolled right and entered the water inverted. A/C apparently lost its M/R before crashing in a fiery ball on the Coastal Hwy 156 near Castroville while on a test flight at approx 1120 hours. A/C crashed in a grassy field near Wicksburg, about 10 mi from Dothan, while on a NVG training mission from Ft Rucker. 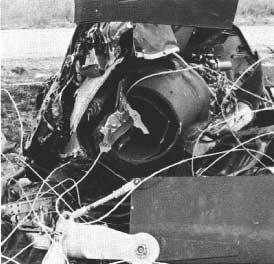 The impact scattered debris for about 100 yds, and the tail section and engine were separated from the fuselage. 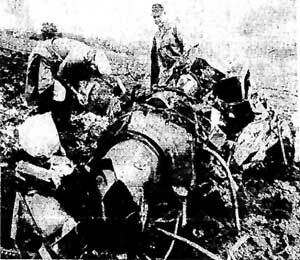 A/C was flying from the unit's barracks at Baumholder to the Army training grounds at Grafenwoehr, when it lost its T/R, crashed and burst into flames in a garden on the edge of a sugar beet field near Unteralterheim. A/C crashed on a pass over a firing range target on Ft Drum at approx 1500 hrs. A/C suffered an engine power loss and came down at a slight angle, slicing off the tops of several trees and caught fire upon impact with ground. A/C crashed on the downwind leg at Toth stagefield during full faced NVG training. The safety board believes the SP may have flown the A/C into the ground while the IP was changing the VHF radio freq to check on wx moving in. 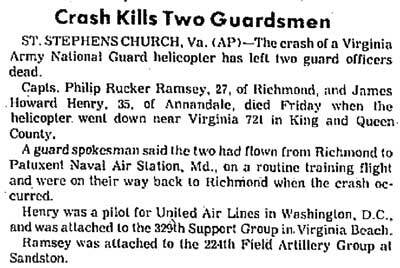 A/C crashed due to a failure of the A-7 fuel control, while on MAST mission to rescue personnel in a downed civilian Cessna. A/C crashed at 2225 hours during heavy rains, low ceilings and limited visibility approx 9 miles north of Taegu while attempting rescue of downed Marine UH-1N helicopter assigned to DET B HML-367. A/C crashed at approx 1100 hours near Townsend during annual training. A/C was hovering to refuel when wind from the rear tipped the acft and spun it around and M/R hit the ground causing acft to roll on its right side. A portion of the M/R blade went into the left side of the cabin and struck victim in the head. *Zilla died May 23 of his injuries. A/C crashed at approx 1145 hrs at Ft Polk during pilot check ride performing hydraulics off landing. After touchdown of simulated hydraulics off landing, slightly nose right, A/C abruptly lifted from runway and yawed right in an extremely nose-high attitude, went into a hard right yaw, causing nose to hit runway. M/R blade struck the ground and A/C flipped over and crashed in right nose-low inverted configuration. Pilot died from head injury when helmet came off during impact due to improper chin strap adjustment. 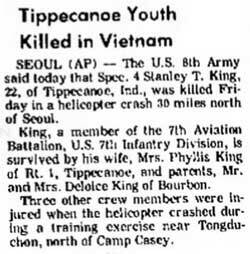 A/C was lead in a formation flight of 5 UH-1s which had completed three troop insertions and were RTB when A/C struck three 3/4" seven-strand powerlines at approx 175' AGL, severing control tubes and crashed near Pocheon at approx 1301 hrs. 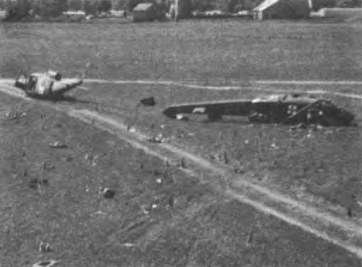 Other aircraft were able to avoid wires. 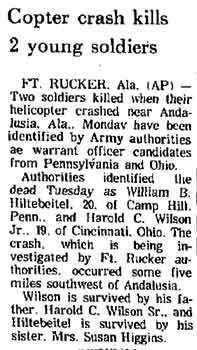 A/C was Chalk 2 in flight of three that departed AAF at 2337 hrs searching for an LZ at night. A/C went IMC after climbing into clouds for unknown reasons and pilot made mayday call indicating that A/C was spinning. 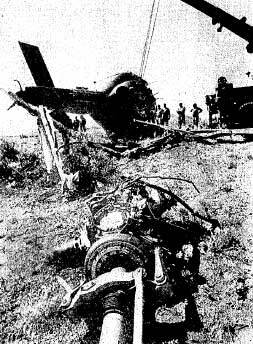 A/C was observed to fall straight down and strike ground and explode. Crash occurred at approx 2355 hrs near Shaw Mountain on the NW portion of Ft Hood. A/C crashed at approx 1130 hrs into trees in area of low visibility approx 20 miles north of Dahlonega after hitting Akin Mountain during a routine training mission. Crew tried to maintain VMC in IMC. A/C crashed at approx 1832 hrs in a windstorm less than 1 mile W of the airfield. 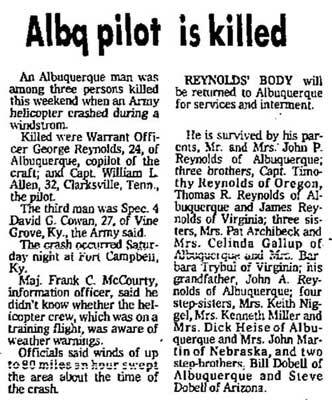 Pilots (Group & BN Safety Officers) tried to beat a thunderstorm flying back to Campbell AAF. A/C was found at first light the next day, with the only recognizable feature being the T/B sticking straight up out of the ground. A/C was seen in a descending right turn, M/R system separated and fell vertically, crashed and burned near Virginia 721 in King and Queen County on a routine training flight while returning from Patuxent NAS to Richmond. A/C was on a night resupply mission and after supply dropoff, five PAX boarded for return flight. 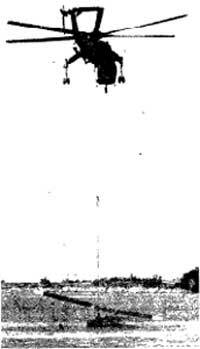 During hover before takeoff, pilot was making a pedal turn and was blinded by landing light being switched on, lost ground reference and control of A/C and crashed at approx 1800 hrs in the upper Ship Creek Valley at Ft Richardson. Suspect crew disorientation due to whiteout conditions when A/C hit the mountain on the right side. 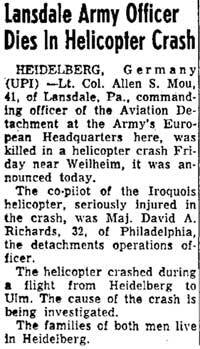 *CE died 31DEC75 of injuries. A/C crashed and burned in an open area near Lake Tholocco while attempting an emergency landing during IP course training at Ft Rucker. Investigation determined that A/C encountered an engine failure and M/R blade struck through the cabin. A/C crashed at approx 1325 hrs in a steep ravine near Timber Mountain while attempting to take off from mountain with all unit IP's, ASO, and CO at Ft Carson. 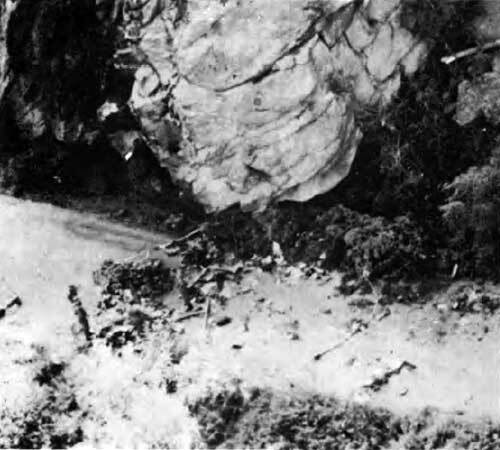 After takeoff, A/C entered right descending turn into canyon and crashed into canyon wall approx 150' below rim. Investigation revealed A/C was approx 900 lbs overweight for density altitude at takeoff point. A/C was on a routine instrument training flight with IP and 2 students and was seen at approx 400' AGL in a steep dive that continued until A/C crashed and exploded 3 miles SE of Marianna airport. A/C departed field site to check weather. Pilot reported weather was too bad and enroute back to field site when A/C crashed 5 miles NW of Rockingham near the Pee Dee River at approx 0645 hours. Heavy fog was reported in the area at the time of the crash. A/C was RTB from a training flight at night due to deteriorating weather when it crashed, under power into heavily wooded area near Lake Tholocco approx 4nm NE of airfield. Special VFR approach into weather which was below IFR minimums was attempted. A/C departed home station IFR at 1057 hrs and at 1134 hrs crew contacted radar control and reported severe turbulence at 6000' MSL. 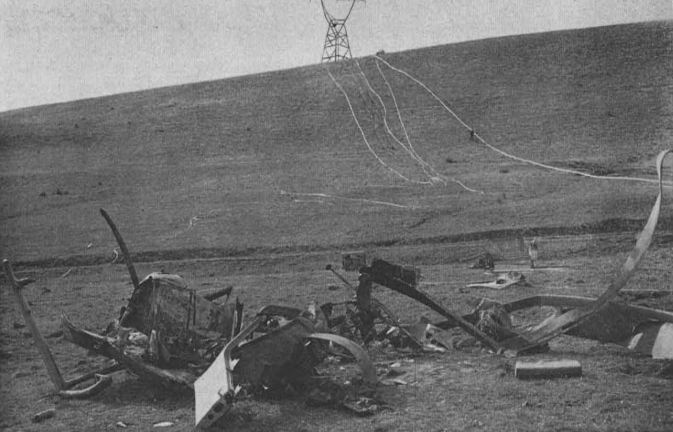 Approx 10 seconds later, A/C disappeared from radar after it apparently entered into mast bumping that caused M/R separation, striking the fuselage at least 4 times and crashed inverted in a wooded mountainous area 15 miles south of Obberot while enroute from Ansbach to Stuttgart. Rotor blade landed 500 meters from the A/C. A/C spun into the Walker Quarry area of Milford Lake at 1100 hrs from a 120' hover and submerged in 35' of water during a routine training mission from Ft Riley. A fisherman rescued the 3 injured about 300 yds offshore. Suspect A/C was overgross and crew attempted to hover downwind in winds of 18 knots gusting to 30 knots. A/C from Ft Campbell crashed 14 mi S of Cadiz and approx 2 mi SW of Veghel LZ at 1330 hrs on a training flight during FTX Orbiting Eagle IV after losing the T/R at night at low level, and went inverted into the trees. A/C crashed in a hilly wooded at approx 0210 hrs area near the E70 autobahn between Wildflecken and Bad Bruckenau during a medevac mission. A/C was performing a simulated air attack while on a service support mission in conjunction with annual training test when it struck wires, pitched up and crashed inverted into a small tributary of the North Han River near Chuncheon at 1030 hours. A/C crashed and burned at 1140 hours E of Winlock off Freeway near Frost Rd. A/C had just left Toledo-Winlock airport enroute to Issaquah when it failed to clear a hill about 3 mi N of the airport. M/R blade landed about 500 yds north of crash site on the Rarey Rd. Visibility was poor at time of accident. A/C crashed on the western edge of Ft Campbell while on a routine training flight. After attempting to pick up a jeep (50# TQE limit), A/C took off from the PZ at night unaided. In an attempt to maintain contact with the flight, pilot entered a slight descending left turn. The A/C entered the tall trees and impacted. CE was thrown from the A/C, CP received broken back. 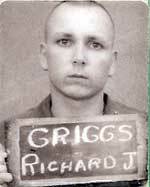 P was killed when his bullet proof seat back severed an artery in his neck. A/C crashed into Eklutna Glacier north of Anchorage during a routine training mission. 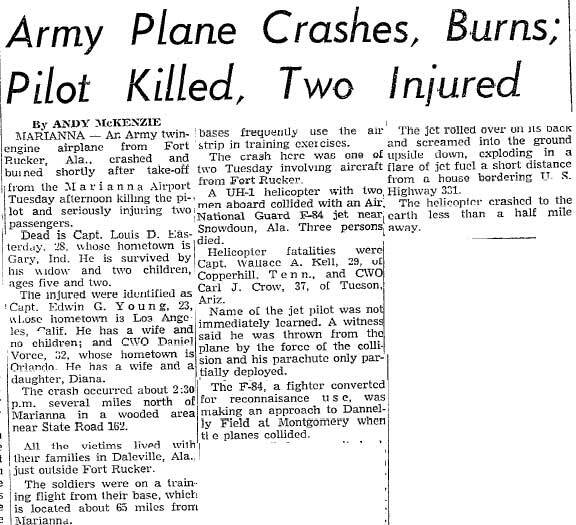 During search for Texas International Flt 655, A/C encountered fog and crashed at approx 1630 hrs during a formation turn, impacted nearly vertical nose-down, and an explosion and fire resulted near Prescott. Member of Army team of helicopter acrobats was killed when he fell 40' while performing at a carnival in Madison. He was climbing a rope suspended from a helicopter when he lost his grip and fell. A/C crashed in Clark Hill Reservoir in 50' of water 300 yards from shore near Plum Branch. A/C crashed at approx 2100 hrs near Oak Grove airport S of Ft Worth while enroute to 300 Aviation Squadron base during violent stormy weather. A/C crashed at approx 2350 hrs 2 miles northeast of Muldraugh at the top of a rocky cliff, 40' above Wilson Rd during a flight to evaluate a new night vision device (starlight scope) at Ft Knox. A/C slung a short shaft, hit a wire during autorotation and crashed. A/C crashed into the North Han River at approx 1430 hours. The CIV PAX was the 18-month old son of the pilot. A/C crashed near Elba after the mast failed resulting in separation of M/R. A/C was performing gun manuevers when excessive attitudes combined with CG issues due to fuel load in ferry tank, caused the mast to shear. Rotor blade was found approx 1 mi from crash site. A/C crashed and burst into flames in a pear orchard adjacent to Sacramento Metropolitan Airport. T/R hit during low level autorotation practice, M/R system severed from A/C, hit ground and rolled right. A/C experienced a power failure and hit high tension wires and plunged into the Santa Ana River bed about 1/2 mile S of Lakeview Ave while enroute to repair another A/C in the Riverside area. 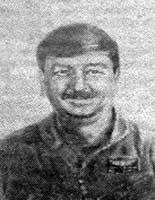 1SG Wood died 2 days later. A/C in flight of three crashed into a field near the village of Hermersdorf during a training flight. 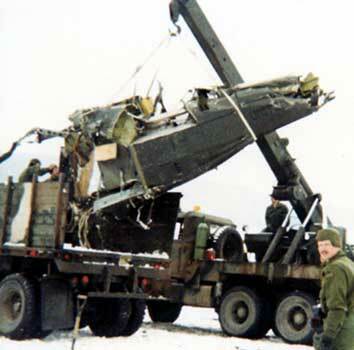 A/C was placed in a bank angle that exceeded both pilot and acft capabilities for the acft weight configuration further aggravated when the pilot applied collective and aft cyclic in an attempt to recover which placed additional loads on an already overloaded rotor system. 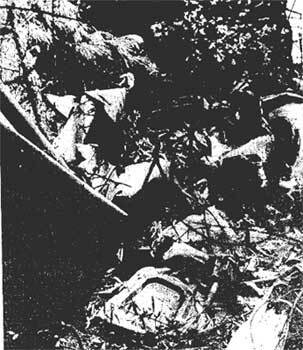 A/C crashed while on a parachute drop mission near the Corregidore Drop Zone due to mast bumping. 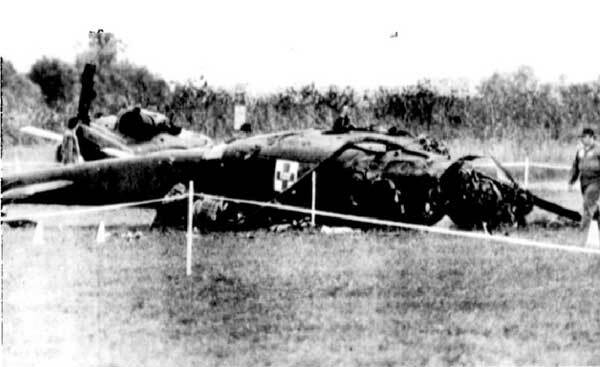 At the time of the crash non-rated 2LT Groce was in the pilot's seat flying the A/C. A/C crashed in the Red Desert near Rock Springs while ferrying helicopter from CCAD to Boise, ID. A/C was chalk #4 in a 4-aircraft ferry flight from CCAD to CA. After an RON in San Antonio, the flight was on their first leg when lead asked for a commo check & no reply was received from chalk #4. Lead turned around to find the burning wreckage. No - mayday was heard; crash attributed to unknown inflight breakup. 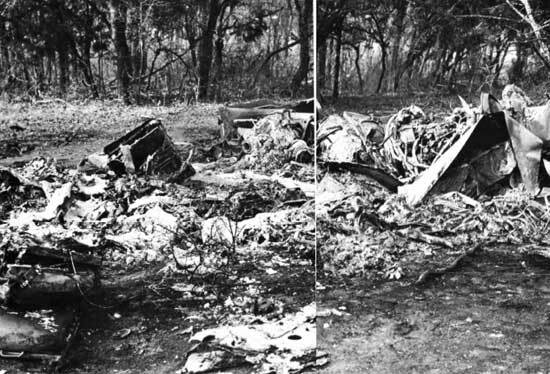 Crashed 5 miles E of Kerrville at approx 1430 hours. 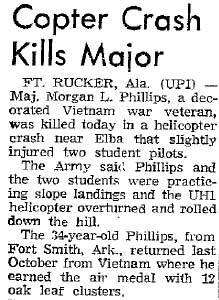 A/C flew into the trees on a moonless night 5 mi SW of Andalusia, while conducting a low-level navigation course at Ft Rucker 8 days before the scheduled graduation of class 71-41. A/C crashed near Wertheim during weather related night crash during a mercy flight to Aschaffenburg to pick up a supply of blood. 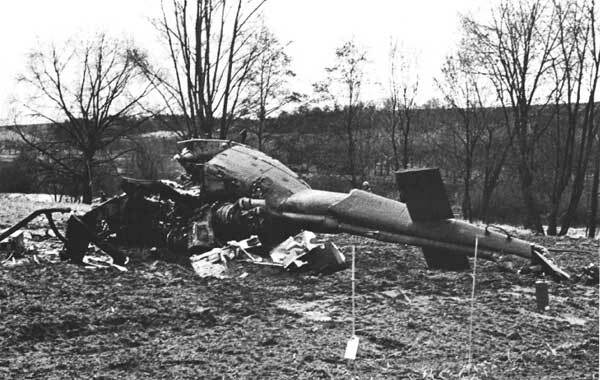 Mid-air crash with an OH-6A #67-16656 during routine training at Lawson AAF. 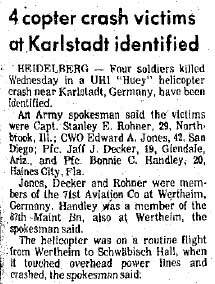 The M/R blade of the Huey entered the OH-6As cabin severing the lower section of the cabin and rupturing the fuel cell. 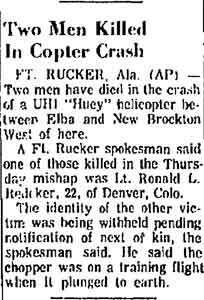 The fuel spilled on the Huey and caught both on fire. The M/R blades and xmsn were torn loose before ground impact. 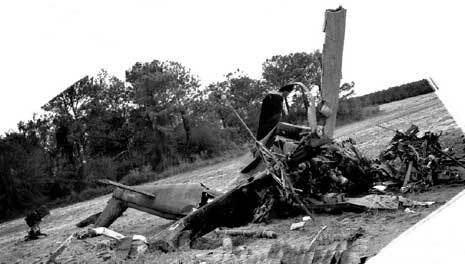 A/C involved in midair crash with an TH-13 #67-17067 3 mi N of Hanchey AHP during training at Ft Rucker. A/C crashed in dense fog near Grafenwoehr enroute to assist in the evac of an accident victim. 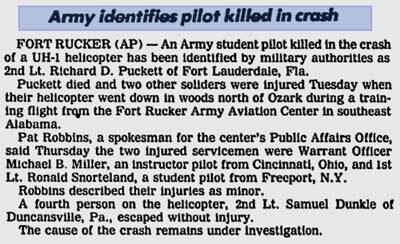 Killed as a result of fall from rope while descending on wreckage of private plane that crashed on Smart's Mountain. A/C hit pine tree during night training exercise (TAC X) crashed inverted and burned. A/C took off at approx 0700 hours on test flight when it crashed into Patuxent River in a steep right turn flying at approx 100 KIAS and immediately sank. A/C was in a 10-ship formation on the Kimpo Peninsula supporting a search for a suspected NK agent, when the #1 hanger bearing seized and the short T/R drive shaft came apart in flight. 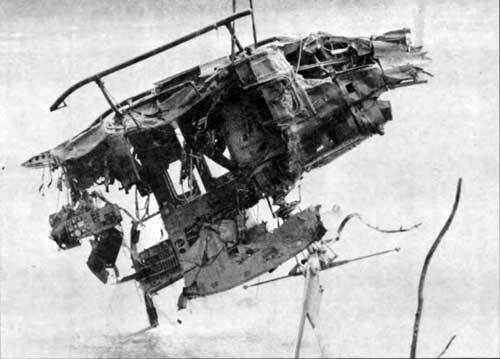 The A/C started a right descending turn when the T/B separated, followed by mast bumping with the rotor separating, crashed and burned upon impact. The partial separation of the exhaust pipe from the rear of the engine case allowed the hot exhaust gasses to impinge upon the #1 T/R driveshaft hanger bearing. The bearing failed due to lack of lubrication. 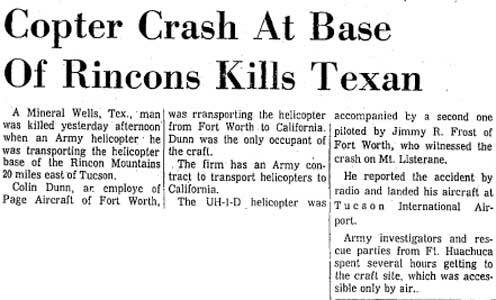 A/C was on a night mission supporting Project MASSTER when it went inadvertant IMC departing Pipeline Gunnery Range on Ft Hood at 0200 hrs and crashed about 600 yds from takeoff point near the Dalton Mountain helipad. A/C from Ft Lewis crashed at approx 2230 hrs, 9 mi east of North Bend on a MAST rescue mission to pick up a motorcyclist injured in a crash with a truck. A/C crashed 18 miles N of Dothan near the Choctawatchee River while on a routine training mission. A/C observed entering cloud, reappeared in steep descent, pulled out and climbed back into cloud then steep descent. 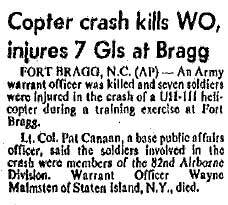 WOC was killed by flying debris while waiting to board A/C that crashed at a site on Ft Benning. The A/C crew was not injured. 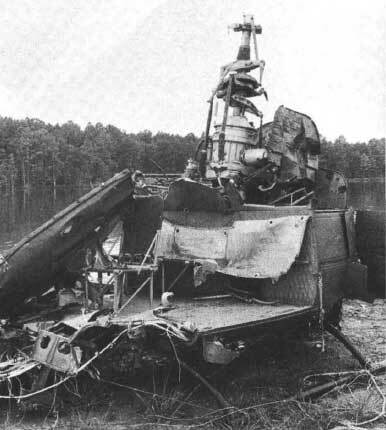 A/C's mast separated and M/R blades struck fuselage, crashed and burned during training at Ft Rucker. A/C was making power recovery from simulated forced landing, experienced severe vertical vibration, crashed and burned near Elba on flight from Ft Rucker. 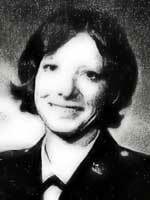 A/C lost control on approach and crashed and burned at Rodriguez Range during a night-time extraction of troops. A/C crashed between Elba and New Brockton on a training flight from Ft Rucker. A/C was flying in chalk 2 position when the T/R hub failed, made a perfect landing down into the pine forest only to set down on a tree stump, which damaged the fuel tank. The fuel rupture sprayed fuel on the engine and the A/C blew up. A/C crashed on a training flight near Elba. A/C crashed at approx 1311 hours during Tac-X training just before graduation on Ft Rucker. A/C crashed 4 mi NW of Pembroke while on a routine training mission from Ft Stewart. A/C crashed and burned in heavy woods during a training mission on Ft Benning. 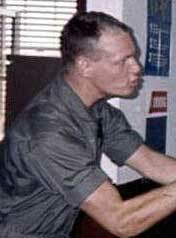 CP died of injuries on 07NOV69. A/C crashed 2 miles from Matteson Range on Ft Rucker in heavy thunderstorms while on a routine mission. 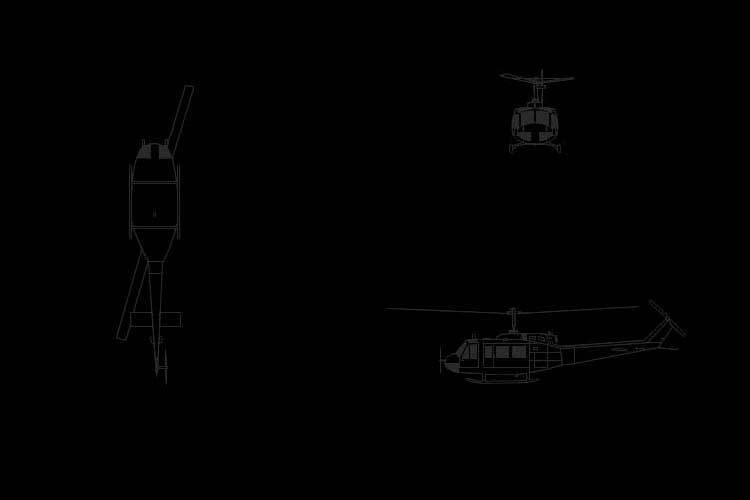 A medevac helicopter carrying soldiers wounded in a clash with North Korean troops crashed shortly after takeoff along the western sector of the DMZ at 2145 hours approx. 3 miles SW of Panmunjom. 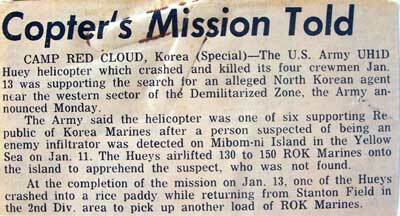 A/C crashed in the Sea of Japan while enroute to its base in Kangnung. Flying conditions at the time were described as marginal with a heavy cloud cover from 700' to 9,000'. SAR operations failed to locate the missing A/C and were called off on December 4. A/C crashed shortly after takeoff from Hunt Stagefield at Ft Rucker after experiencing an engine failure. IP was in full control of emergency landing until they hit power lines during the flare which flipped the A/C upside down. It then burst into flames. 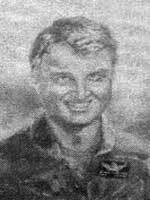 A/C assumed abrupt nose down then pitched up nose high then rolled to right and crashed at Ft Rucker during dual training 3 days before graduation. A/C experienced a mechnical problem while taking off, crashed and burned approx 18 miles N of Junction City, near the intersection of K82 and Hwy 77. A/C pitched forward into a high speed dive while changing position in formation flight cutting through 250' of trees on Ft Stewart. A/C crashed 9 miles east of Eufaula while participating in a training exercise with the Ranger Department of Ft Benning Infantry School due to engine failure on low level gunnery training run. 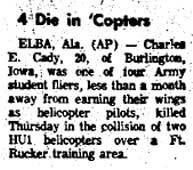 Mid-air collision of two HU-1s about 1-1/2 mi E of Elba while on a tactical training flight from Ft Rucker. The student pilots were less than 1 month from earning their wings. 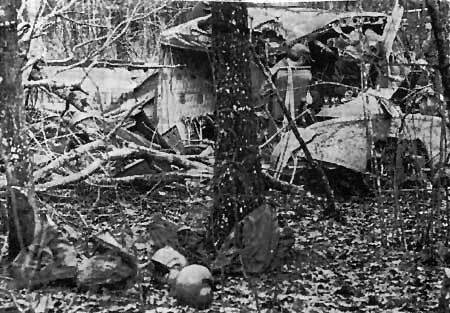 A/C crashed and burned in a wooded area near Hunter AAF while on a routine training mission. A/C crashed during training flight from Hunter AAF approx 5 miles NE of Rincon. A/C crashed near Elba while on a training flight practicing slope landings when A/C overturned and rolled down a hill. 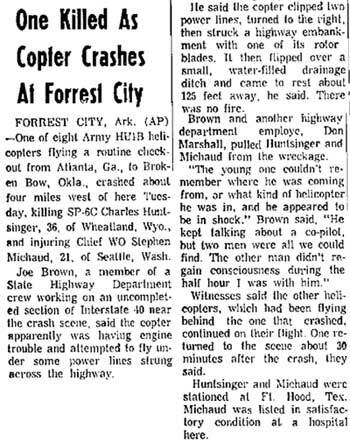 A/C was in flight of 8 flying routine checkout from Atlanta to Broken Bow when it crashed 4 miles W of Forrest City near I40 after hitting power lines across the highway. A/C was attempting emergency landing after experiencing engine trouble. A/C crashed at approx 0550 hours during a rain storm near the NE fringe of San Antonio after dropping off an automobile wreck victim at a local hospital. Probable cause was spatial disorientation. A/C crashed in a pasture on the Andy Kane Ranch on Squirrel Creek Rd, approx 7 mi E of Fountain shortly before noon due to "Jesus nut" (M/R mast retaining nut) coming off while on a routine operational training flight from Ft Carson. A/C crashed at the base of Mt Listerane in the Rincon Mountains at approx 1300 hrs while transporting from Ft Worth to Sharp Army Depot in California. A/C crashed at approx 2330 hrs near Bonifay while on a routine night training flight a few days before graduation at Ft Rucker. Mid-air over Dorret's Run firing range at Ft Knox during the final dress rehearsal for a demonstration for West Point cadets, etc. which involved two slicks flying side-by-side. Their blades meshed producing the mid-air. 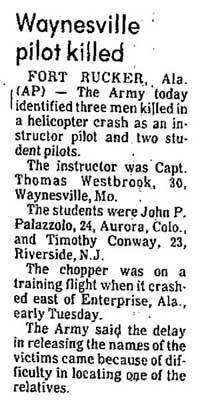 NOTE: All victims are listed together since specific crews/pax were not known which aircraft they were on. Pilot Knoll and CE Knoll were brothers. A/C exploded and crashed near Wicksburg while on a training flight from Ft Rucker. 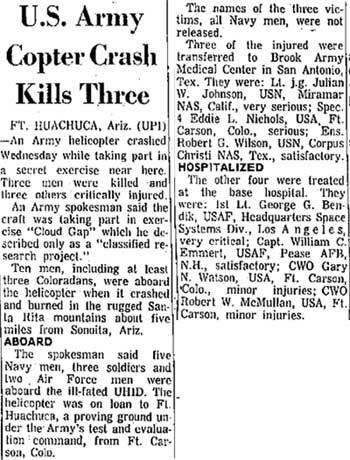 A/C crashed and burned in the Santa Rita mountains about 5 miles from Sonoita while taking part in exercise Cloud Gap (classified research project). A/C was attempting a mountain peak landing and at approx 150' above landing site, rotor RPM dropped to 6400. Pilot applied power for go-around but A/C continued to descend and lose RPM. 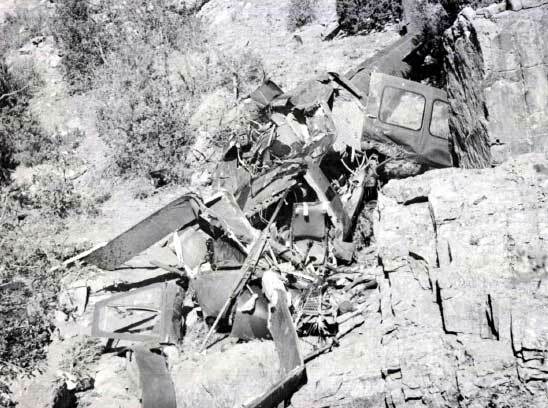 At 20' AGL, A/C suddenly turned right and settled down to ground, M/R blades hit rock outcropping next to landing area, pitched up then fell down the side of mountain, rolling several times coming to rest far below the saddle and was consumed by post-crash fire. *Bendick and Johnson died 1 day later. A/C crashed at 1155 hrs at Port St. Joe in a vacant lot, just east of the Overpass Bridge, alongside US Hwy 98 while on a logistic evaluation flight. Another A/C on the same flight landed near the scene of the crash. A/C experienced mast separation, crashed and burned in a swamp near the Chocktawahatchee River about 6 mi NE of Ozark while on a routine training flight from Ft Rucker. A/C crashed approx 10 mi S of Geneva shortly after nightfall during training flight from Ft Rucker. 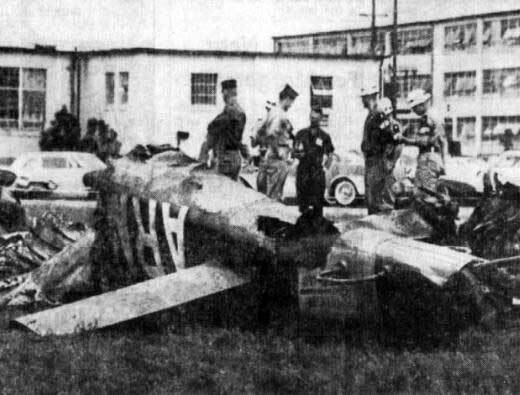 Mid-air collision with a USAF F-84 near Snowdoun at approx 1,500-1,700' AGL. 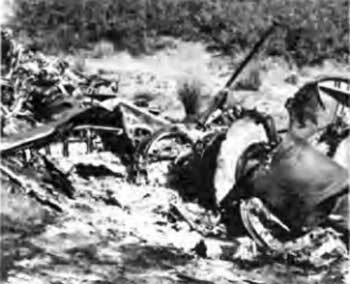 Jet pilot was also killed. 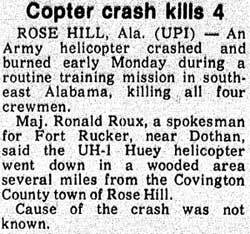 Mid-air collision with another Huey 5 mi south of Samson near the Alabama-Florida line while on a training flight from Ft Rucker. 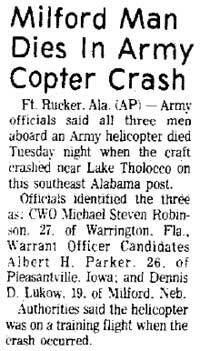 A/C exploded in flight and crashed about 6 mi E of Elba off Alabama 189. A/C crashed at approx 1100 hrs about 5 mi N of Saginaw while on an acceptance flight out of the Globe plant near Blue Mound. A/C crashed on gunnery range in final weeks of WOC training. A/C was being ferried from the Bell Helicopter Co. plant in Hurst to the Sharpe General Depot in California, when it exploded and crashed between Stephenville and Mineral Wells in the Morgan Hill area at 1215 hrs. The M/R came off due to mast bumping, cutting into the A/C causing the explosion and crash. Mid-air between two UH-1B during formation flight on Ft Benning in light rain conditions. M/R blades meshed and both exploded upon impact near King's Pond. Mid-air between two UH-1B during formation flight on Ft Benning. 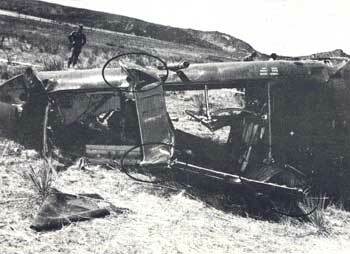 Two aircraft involved were trailing. A/C crashed near Weilheim while on a flight from Heidelberg to Ulm. No further details. 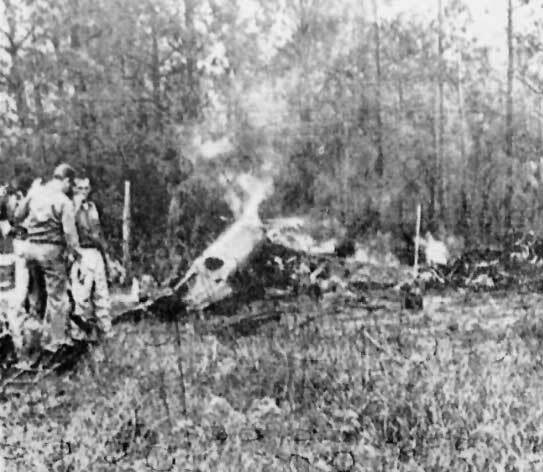 A/C crashed shortly before noon 9 miles NE of Cheraw during Air Assault II exercises due to engine failure followed by extended glide to clearing and hit trees. 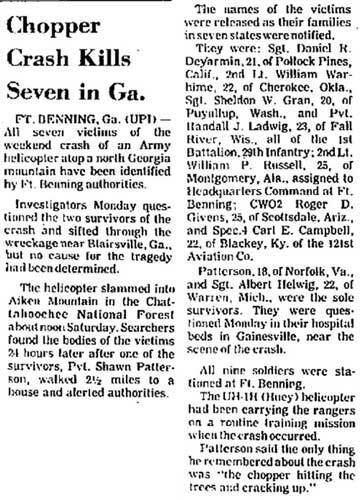 A/C crashed about 4 miles north of Cheraw during Air Assault II exercises. A/C was peforming a maintenance test flight with crew of 3 and 3 PAX when it crashed near the base dental clinic near the intersection of 52nd St and Kansas Ave on Ft Campbell at approx 1030 hrs. A/C crashed in Makua Valley on the island of Oahu during Exercise High Top II manuevers after it apparently developed engine trouble at 50' AGL. 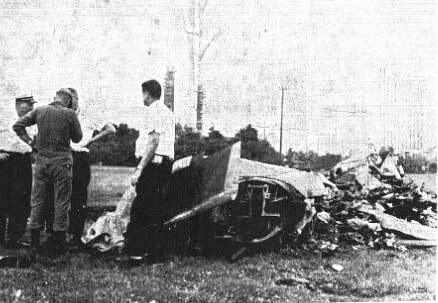 A/C from Ft Benning crashed and burned while firing machine guns on Ft Stewart's Metz range. 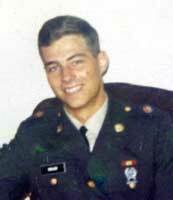 *1LT Whitcher died of injuries on 07MAR64. A/C hit a tall pine tree, flew approx 100 yds parallel to highway before crashing into a grove of trees in heavy fog, burst into flames 200 yds off US Hwy 27 in Harmony Church area. A/C crashed at approx 1645 hrs 8 miles SW of Candor while on a routine training mission from Ft Bragg to Charlotte. A/C was on a short 3-legged, cross country flight that departed at 1600 hrs. 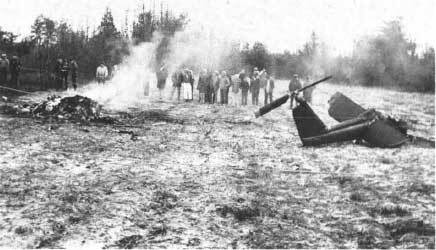 Evidence of inflight fire prior to impact and wreckage was distributed over an area of 1800' long and 200' wide. 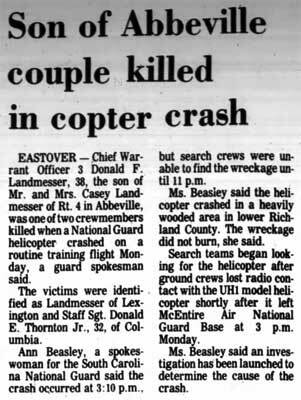 Probably cause was inverted or near-inverted attitude during bad weather causing severe rotor flapping and subsequent mast separation. A/C crashed at approx 1320 hrs just after placing a cross atop St Mary's Roman Catholic church under construction in Goeppingen. There was a miscommunication between construction workers and the pilot that the load was detached, however as the A/C began to depart, the stress from the load caused the A/C to turn upside down, crashing to the ground nose first. A/C from Ft Lewis crashed and burned after it struck power lines about 8 miles N of Ellensburg, near the Reecer Creek area while reconnoitering for Exercise Coulee Crest. 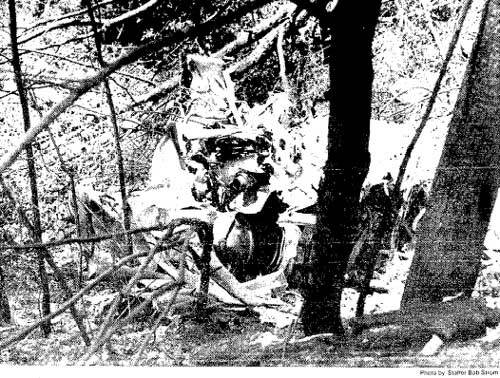 The main fuselage came to rest directly underneath the power line and the tail section rolled approx 40' down a hill. A/C crashed after striking a tree during a routine training exercise conducting an air mobile assault field test with 82 ABN PAX at Ft Stewart. A/C crashed at 0906 hours about 2 1/2 miles from the main gate and only 1000' east of Colorado 115 while on a routine training mission. 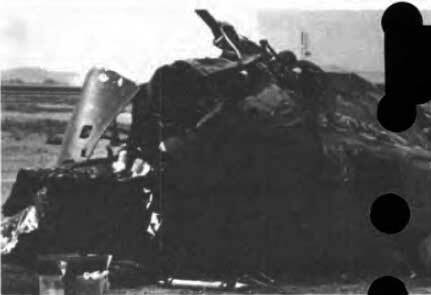 Loss of rotor RPM, pilot initiated a full flare, close to the ground and impact occurred at 20 degree attitude, nose up with a 30 degree right roll at 60 KIAS. A/C rebounded into the air and struck the ground with a 30 degree left roll, rebounded once more in the air with remaining fuselage and rolled 1 1/2 times coming to rest inverted. MAAG A/C based at Feng-shan crashed into a hillside 10 miles S of Taipei at 0953 hours. A/C departed home field at 0900 hrs for a local flight to a nearby drop zone for staff officers to observe an airborne drop. The drop was canceled due to 300' overcast and visibility at 1-1 1/2 mi in fog. 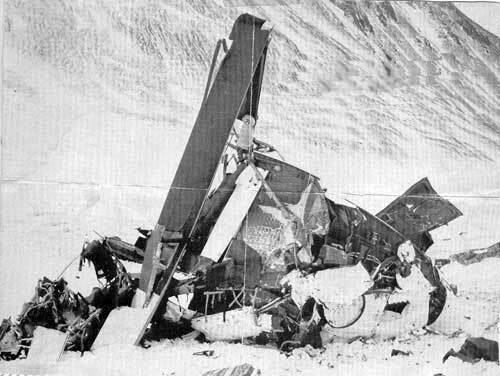 Wreckage was not found until 2300 hrs and investigation determined that A/C crashed in a left climbing turn of 32 deg into a 35 deg mountainside at an elevation of 1150'. Pilot attempted VFR into IFR weather by pilot not instrument qualified under direction from demanding officer. COL Cheatham was chief of the MAAG for southern Formosa. 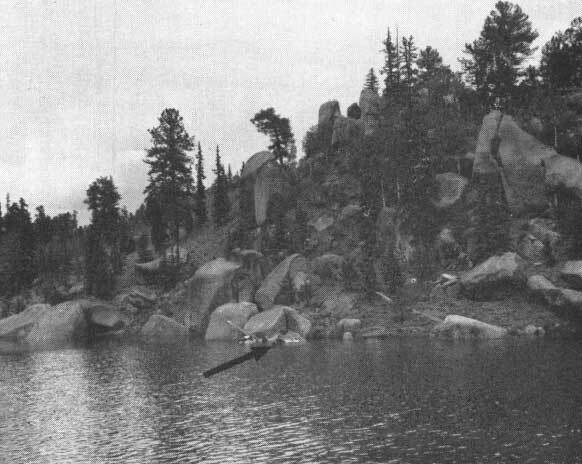 A/C struck a mountain outcropping and crashed into Beaver Lake at approx 0805 hours while on a news photographic mission, taking pictures of survival training given to all new AF cadets. 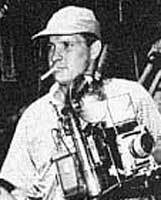 Keister was a news photographer for the Chattanooga Times and other PAX was the PIO at USAF Academy. A/C crashed and burned at approx 0900 hrs while on a paratrooper training mission at drop zone located on the Kentucky-Tennessee line on Ft Campbell. 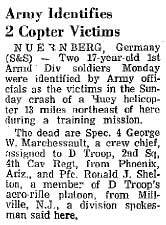 A/C had dropped 4 paratroopers when it crashed in an open field near the Yamoto DZ. 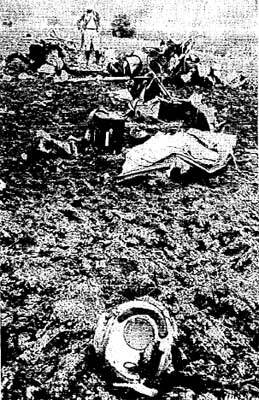 Accident caused by material failure of collective pitch sleeve lock. A/C crashed in a Kawasaki village field near Camp McTureous. A/C was on a transport flight and while RTB, crew smelled smoke. During descent, a high freq vibration was felt followed by a severe vertical vibration. At 50-100' AGL, pitch was pulled but had no effect and A/C struck ground in near-level attitude and approx 15g. A/C rocked forward on nose, bounced and hit an embankment causing fuel cells to rupture. Caused by short shaft failure. Gear coupling froze as result of extreme heat. Shaft sheared from coupling after seizure.